This weekend I will not have a theme for my marathon. I will just be watching whatever movie I am in the mood to watch when I am in the mood to watch it. Though I am sure I will watch some off my unwatched shelf to make room just in case I get any movies for Christmas this year. When three Texas University students travel to a Mexican border town on the eve of their graduation, the last thing they expect is to face their own deaths. Without warning, they fall prey to an ancient blood cult hellbent on finding candidates for human sacrifice. Based on true events, Borderland tells a story which blends the raw fear of Texas Chainsaw Massacre with the stark reality of In Cold Blood. evoking a world soaked in paranoia, fear and dread. I normally at least enjoy movies that are part of the After Dark Horrorfest releases... but in this case it was a struggle for me just to stay awake through the movie. And I will admit that I did dose off while watching for a few minutes 3 or 4 times. Maybe if I would be able to stay awake through-out the entire story I would be able to give it a higher rating... but until then I have to say I am less then impressed. Geena Davis (Thelma & Lousie, BeetleJuice) and Matthew Modine (Married to the Mob , Full Metal Jacket) deliver a tidal wave of nonstop action and adventure in this swashbuckling saga of ruthless pirates, buried treasure and bloodthirsty betrayal. I am personally not a huge fan of pirate movies... but I do enjoy one every now and then. I mostly bought this movie on no other merit then it starred Geena Davis... who I always have enjoyed. And even though it is not my favorite subject matter... I did enjoy this one. I thought Geena Davis did a great job as usual. I really love a strong woman.... and that is something you pretty much always get from characters Geena Davis plays. The only thing horrific about Cutthroat Island is the acting, the script, the direction and the editing. Other than, brilliant! Yeah... those are good... I have (and enjoyed) the first 2... never got to see the 3rd one yet though. LOL... now I liked Geena Davis in it... I think she did a good job with it. 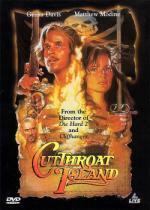 It has been a long time since I saw it, but I did like Cutthroat Island. And I loved the Pirates of the Caribbean Movies..there were certain things about teh 2nd and 3rd I didn't care for, but I still liked them overall. My reviews on them at Epinions have done fairly well with hits. A lonely and intense 14-year-old horror movie junkie, Zach ('Chauncey Leopardi') is a good kid but a little confused as a result of his parents' recent break-up. Perhaps for this reason, he often tends to stretch the truth. His friends, J.T. Heffernan, a computer geek, and Gabrielle "Gabe" Lattanzi, a lovely, intellegent athlete, humor Zach, but knoe just how much to believe. This is the second time I watched this since I bought it. The first time during my month long horror marathon last month. This morning I decided to watch it with Brittany to see what she thought of it. I enjoyed this movie just as much this time as I did the last time I watched it. Sure it is not big on scares or Gore... but it is a fun movie that is good for the whole family. This movie would make a great addition to your Halloween tradition for your family. Brittany really enjoyed this one as well. She is glad I wanted to show it to her. All the sudden I was in the mood for something fun.... something silly yet something horror related. So what better to pop in then Army of Darkness? 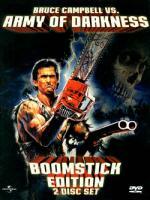 I have watched Army of Darkness many times... but this is only the second time I watched the Director's Cut. I think I enjoy the Director's cut a little better then the theatrical version... I like that final laugh that they give you at the end of the Director's Cut. I saw a little of Army of Darkness on a movie channel earlier in the week..but it was starting fairly late and I had to get up early, so I was trying to get to sleep. I liked what I did see. 'The Death of the Incredible Hulk' is the fascinating finale of the hugely popular TV series about a scientist, Dr. David Banner (Bill Bixby), who transforms into a mighty, larger-than-life beast called the Hulk (Lou Ferrigno) when he gets angry. Desperately trying to rid himself of his monster-like alter ego once and for all, Banner sneaks into a government research lab run by Dr. Ronald Pratt (Phillip Sterling), hoping to find a solution. When Pratt discovers Banner's plight, he offers to help. But a beautiful spy (Barbara Tarbuck), who's out to steal Pratt's ideas for terrorists, forces Banner to choose between love and loyalty, good and evil, and ultimately, life and death. After my daughter was telling me about how much she enjoyed the new Incredible Hulk movie she watched on the bus coming home on a school trip the other day... it really got me in the mood to watch some Incredible Hulk. Unfortunately I don't have the new movie yet... so I decided to watch one of the TV Movies from the series. This is (obviously) the final movie in the series. It is also my least favorite of them all. Not because it is a bad movie... it really isn't. But it is a little slower paced then the previous ones. And in the other 2 we had guest heroes in the movie (Thor in one... Daredevil in the other) where this one does not have that. But I am glad I have this one... and enjoy watching it every now and then. We had a rather different class of entertainment on our school trip buses and would normally only end after the driver ran away screaming. Yeah... us too! but now they take these nice tour buses on school trips (we always had to ride in school buses!) with DVD Players, rest room in the back... the works! Must be nice!